Gravity or gravitational forces exist when one object attracts another. We're not talking about finding someone really cutey-wootie, awwww! We're talking about the molecules of one object pulling on the molecules of another object. It's like the Earth pulling on you and keeping you on the ground. That's gravity at work. 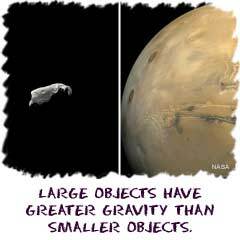 Every object in the universe that has mass has a gravitational force. Even you exert gravity. When you compare your mass to the mass of the Earth, your gravitational force isn't very impressive. Sorry about that. Obviously gravity is very important on Earth. Other planets also affect our world. Our connection to the Moon's gravity makes the tides rise and fall. The Earth's gravity keeps our planet orbiting the Sun, just like the Sun's gravity pulls on our planet. When the earth spins and gravity pulls on the clouds, weather can be affected. We have to bring up an important idea now. The Earth always has the same pull on every object. If you drop an acorn, or you drop a piano, they will fall at the same speed. It is the Earth's gravity and pull that make objects speed up when they are falling. The Earth constantly pulls and objects constantly accelerate. "People always say, "What about feathers? They fall so slowly." Obviously, there is air all around us. When a feather falls, it falls slowly because the air is in the way. There is a lot of resistance and that makes the feather move slower. The forces at work are the same. If you dropped a feather in a container with no air (a vacuum), it would drop as fast as a baseball.